Over the last week or so I have been looking to expand my language skills and have been looking at Rust and with it, the Redox operating system built in Rust. I have always been intrigued by OS dev and in an effort to improve my skills in that area, thought I would take a crack at building Redox. This covers my experience attempting to do so. The Redox Book provides a guide for getting up and running with Redox, however my experience of this is that it's somewhat incomplete (perhaps an opportunity for me to contribute to the overall project). Starting at Preparing Redox it walks through the steps required to get Redox to built and run in Qemu. Unfortunately, these steps didn't work for me. Undeterred, I pressed on and was ultimately able to boot up Redox in Virtual Box. The next few sections will describe what I did and what didn't work along the way. (Note that I've skipped over installing Rust - rustup makes this dead simple). My build environment is an Ubuntu 16.04 LTS virtual machine, running in Parallels on my 2013-model MacBook Pro. The VM has 4 vCPU's and 4Gb of vRAM allocated to it. and everything should be hunky dory. A quick look at the GitHub issues for the project led me to find this issue, which talks about needing to install a specific toolchain in order to build Redox. Looking at the comments associated with this issue (at least, when I started attempting to build it), the process seemed straight-forward. Clone the repository, make sure the appropriate dependencies are installed, build, add to path. Installing the dependencies is pretty straight forward on Ubuntu, as the repository includes an ubuntu.sh that can be executed to get the dependencies at their required versions (note: I was foolish when I began and didn't notice this script. Use it. Trying to install the dependencies manually just by letting the setup.sh script fail will lead to further issues). One thing to note is that if you have other versions of autotools installed (as I did), you may need to change the simlinks for aclocal and automake to match the versions used by the setup. You can do this (on Ubuntu anyway) by editing the simlinks in /etc/alternatives/. If you don't, you'll likely come across issues version conflict problems. Despite getting this far, I was still unable to actually build the toolchain, hitting the same issue of a missing syslimits.h reported by the last commenter in the aforementioned issue. I've not been able to resolve this so far. Fortunately, there are binary toolchain packages (something I only discovered after attempting to get it going myself). I discovered these going back through other tickets that are opened and about this ticket which points to binary releases of the toolchain available in deb format. Once I had these images, I created a new VirtualBox VM (type Other/Other 64-Bit) and attempted to boot with the standard settings. No luck there, the boot process hangs not long after it commences. A quick google search of Redox + VirtualBox leads us here which provides details of the hardware configuration required for Redox to boot in VirtualBox. A quick change/verification of the settings for the VM and you should be presented with the Redox login screen. One thing to note: VirtualBox feels that the operating system can support Mouse Pointer Integration. This doesn't work for me, and so to get the mouse going within the VirtualBox instance, I have to disable mouse integration each time a boot. 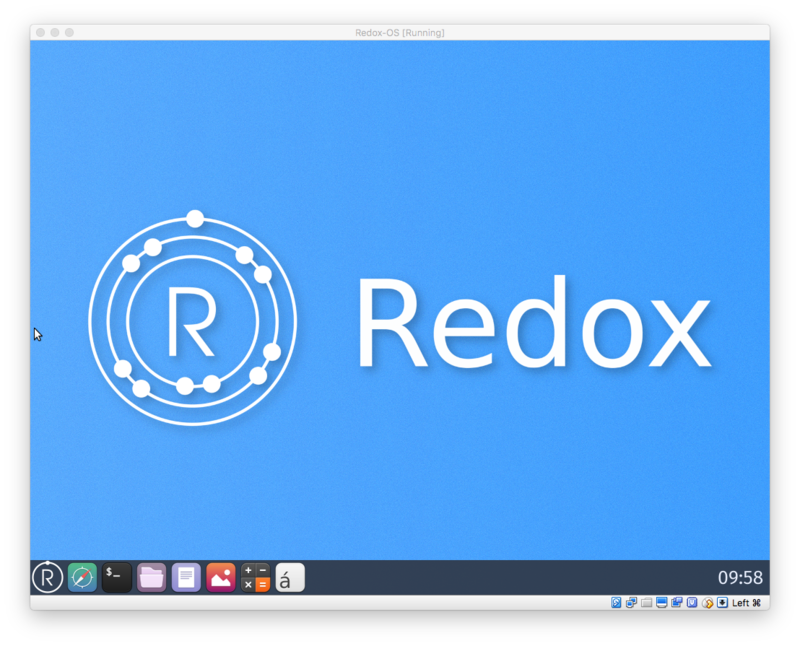 Once that's done, log in with Redox's default user credentials and you should be presented with the Redox Window Manager (Orbital).